Unity minister Linda Martella-Whitsett provides a new framework for thinking about prayer that will revolutionize the lives of readers everywhere. The good news here is that you can pray without believing in God; that you can have a rich and fulfilling spiritual practice without adhering to a set of creeds or dogmas. Martella-Whitsett encourages seekers to look within rather than outside themselves for a God in the sky, for the spark of the divine that is at the core of their being. 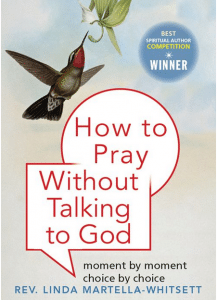 How to Pray Without Talking to God shows how to develop a true spiritual practice by: re-forming the words of traditional prayers; cultivating a habit of daily prayer and meditation; learning how to pray with others. How To Pray Without Talking To God is filled with the author’s stories of her own evolving understanding of God. Each chapter includes a section called “Talk to Yourself” that poses questions for readers to write about or share in a study circle.